L.A. based 3D Multimedia "Everyday" artist Switzon S. Wigfall, III aka "SSWIII" (pronounced "S-S-W-3") sits down at his desk of his home studio and creates a new cgi-art piece from scratch turning a blank canvas into abstract eye candy sci-fi like renders using Cinema 4D. Creating "Everydays" is one of his daily creative exercises to help spark ideas, projects and learn new techniques and concepts for his much bigger projects. Exploring the limits of his imagination he found himself starting to animate these digital frames (everyday art pictures) and turns them into animation where he makes them into vj-loops or clips releasing them for free under a Creative-Commons license. Capturing the moments of his process through the lens of Photographer/Videographer James Bishop of "Media Vomit" studios we go all in with SSWIII's ideas, thoughts and creative process when creating these daily art pieces as he says he's been inspired by many 3d cgi-artists in the "everyday art era" to create his own series of "Everydays" as well. We also learn how SSWIII is slowly working on incorporating his own music (hip-hop beats) into his visual work also being inspired by his peers and generation of the LA beat scene visually and musically pushing into becoming the A/V artist he aspires to be soon. 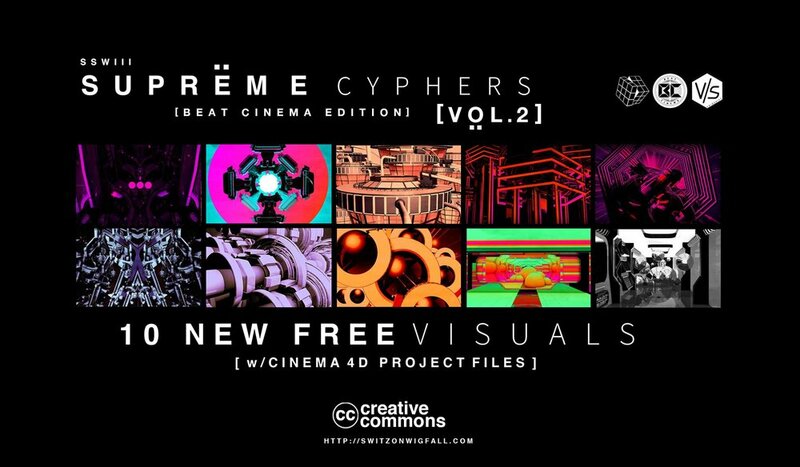 All of his visuals/vj clips are free short, animated, abstract visuals for VJs and creative professionals released under a Creative Commons license allowing anyone to download, use, and rework his original digital files.